Paul and Dan Fireman—already big supporters of The First Tee chapters in New Jersey—are taking their commitment to the next level. In an unprecedented “donation,” the Firemans are giving themselves and their time to The First Tee participants. 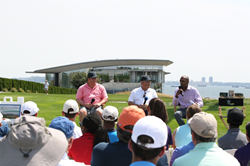 Dan (left) and Paul Fireman with Golf Channel's Damon Hack at the recent First Tee Classic held at Liberty National Golf Club. “The generous support of the Fireman family to The First Tee continues with their willingness to connect directly to young people in New Jersey,” said Joe Louis Barrow, Jr., chief executive officer of The First Tee. Paul and Dan Fireman—already big supporters of The First Tee chapters in New Jersey—are taking their commitment to the next level. In an unprecedented “donation,” the Firemans are giving themselves and their time to The First Tee participants. One fortunate student from each of the four non-profit chapters in the region—Essex and Plainfield, Monmouth and Ocean, Raritan Valley, and Greater Trenton—will have the opportunity to meet with one or both Firemans at least once a year to talk about goals, aspirations, and career paths. It’s just one more way Paul Fireman, founder and former chairman of Reebok and current chairman of Fireman Capital Partners, and his son Dan, managing partner of Fireman Capital Partners, are backing The First Tee, a 501(c)(3) nonprofit youth-development organization whose mission is to impact the lives of young people by providing educational programs that build character, instill life-enhancing values, and promote healthy choices through the game of golf. The Firemans, owners of Liberty National Golf Club, recently hosted The First Tee Classic fundraiser at their golf course and have made generous financial contributions to the organization. The First Tee chapters in New Jersey reached nearly 64,000 young people in 2014 through programs that seamlessly incorporate The First Tee Nine Core Values and character-building life skills with golf. More than half the children enrolled are able to participate thanks to financial scholarships provided by donors. With the support of the Firemans, the combined goal of the New Jersey chapters is to reach 125,000 youth by 2020. Preparations are already underway for next year’s golf fund-raising benefit on Monday, Aug. 22, 2016 at Liberty National Golf Club. The centerpiece of this exclusive event is the golf course at Liberty National, regarded as one of the game’s great new championship venues, and site of The Presidents Cup 2017. One of the world’s most picturesque golf courses, the club is located along the Hudson River in Jersey City, N.J., and features unmatched views of the Statue of Liberty, Ellis Island, and Manhattan skyline. Designed by U.S. Open Champion Tom Kite and course architect Bob Cupp, Liberty National has hosted the first event of the PGA TOUR’s FedExCup Playoffs, The Barclays, in 2009 and 2013. Golfers can register to play in The First Tee Classic at Liberty National Golf Club as an individual, or as a foursome, with lunch, golf, gifts, and evening festivities included. A limited number of tickets are available for the evening event. Additional information, including sponsorship opportunities, may be found at http://www.firstteelibertynational.com.